about our classes. As I was explaining about our classes, I mentioned my several assistants who help out during class, seeing a puzzled look I briefly explained my teaching philosophy about using assistants. Grand Master Remy Presas (the founder of Modern Arnis) use to tell us when we closed out a training camp how important it was to find someone to teach the art to. He would encourage us no matter what our rank was to find someone and teach them. GM Remy knew that by passing on something we learned at the camp we would be growing in the art; that we learned more from the process of teaching others than just doing a drill in the air by ourselves, and that by being focused on helping others in some way it would enrich our lives. We might not be able to pass on the higher levels of the art, in fact we might be only able to pass on a basic drill, a basic concept, a couple of techniques even, it didn't matter really because whatever it was it would help us make the art our own and enrich our understanding of his art. I believe in this whole heartedly and put it into practice daily during my classes at the Rec. Center largely through my use of assistants. I believe that a student learning to take ownership (of a task given), feels a sense of accomplishment when they have helped another student(s) succeed or learn something. Often times I will have that student stand beside me as I check out the students they were assigned to and then offer some advice on further correction of the student but still praising them for helping out. Using assistants to help other students also helps build camaraderie in the class. So while I don’t have an official “leadership” program per say, I do select students who have shown initiative and a desire to help out and then I'll start working with them to train them to teach in some format or another no matter what their rank. One of the first things I look for is the interest of the students, these are the students who try and come early to class. Often times these students come to the earlier class before their own and will wait patiently on the side lines. Generally, depending upon several factors of how class is going that day; I’ll call them in to demonstrate a technique, to join in a drill etc. etc. somehow or another I’ll try and use them in class and reward their good behavior (by spot lighting them or including them in class). The next level is generally the students who are of higher rank who I know (from experience) can lead others. These students often times show up early in order to help out in the lower level class. 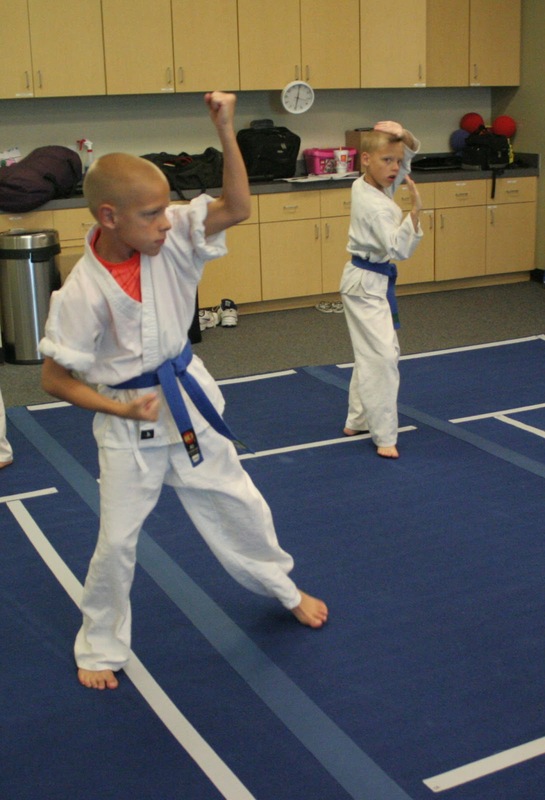 Because they are acting as assistants in a lower ranked class I have them line up with me (where the instructor’s line up) even if they are below black belt rank. Currently I have four blue belts; the twins (Rod and Z), and Cynthia and Matthew who have been very helpful in this regard. These four students have been instrumental in working with and teaching the beginning colored belt class students and the assistants I want to high lite today. 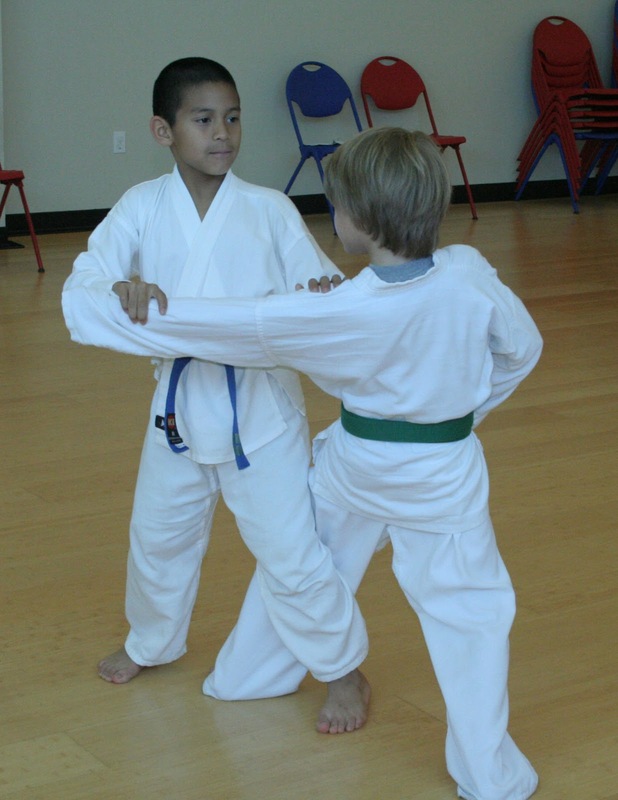 That both Rod and Z are good students goes without saying really, the fact that they can teach and help the other beginning and intermediate belts are icing on the cake so to speak. While I monitor the whole class I’ve over heard the boys at times telling the student they were assigned to “Mr. Lynn says….” Or “Mr. Lynn has us do it this way” etc. etc. I couldn’t believe the detail that would be repeating what I say in class, almost word for word descriptions of techniques or applications. However they tend to connect with the younger kids in ways that as an adult I can’t, all of the while staying on task trying to help the student they were assigned to. Cynthia and Matthew have a similar skill set in reaching out to the students and teaching them at their level. The other day I assigned Cynthia and Matthew to work with two of my Orange belts on their prearranged one steps drills that are required for their next stripe. Cynthia and Matthew covered more material teaching these students than I had on at least two classes prior to this one. To top that off Cynthia and Matthew had them performing better than I had. 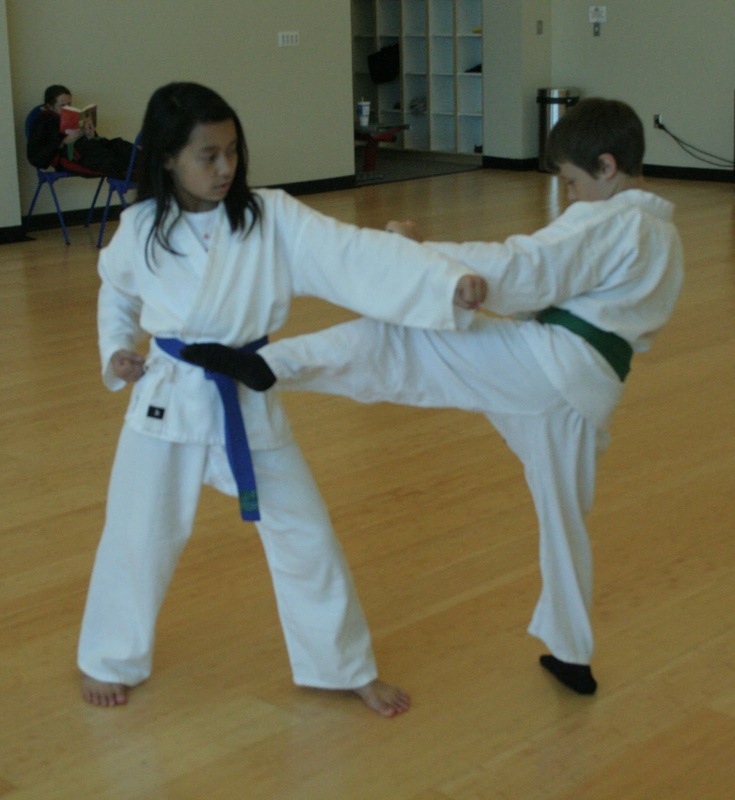 Cynthia and Matthew like Rod and Z before them often come to the earlier beginner class specifically to help out. 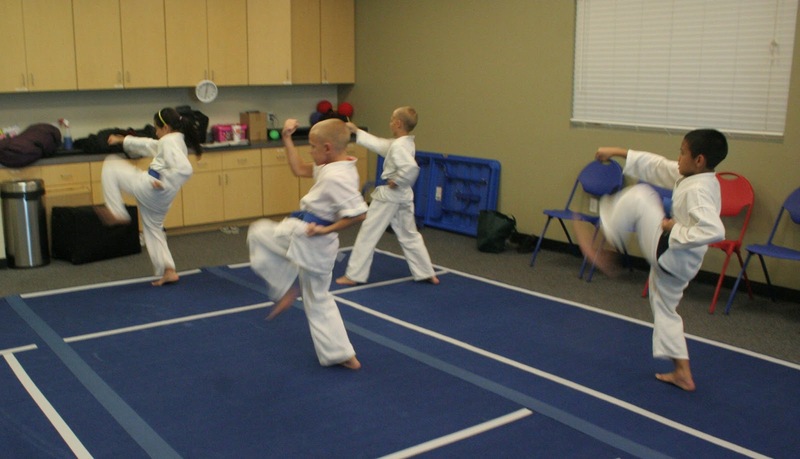 All of these students (Cynthia, Z Rod and Matthew) work very hard during class and are excellent examples of karate technique at their belt rank levels; their katas, their blocks, kicks and punches are all very good. All four of them know all of the requirements that I have taught them for their next belt level and Matthew and Cynthia also learned our Modern Arnis anyos (katas or forms); Anyo 1 (Empty hand form 1, and the stick anyo 1-3. At the end of every class I always instruct the students if they were helped by an assistant then the student should go to the assistant and thank them. Likewise parents if your child has been helped by these assistants, I’m sure their parents would like to hear from you as well. Considering that all four of these assistants are 10 years old and younger; their parents are taking time out of their busy schedules to bring them early to class often times waiting patiently for two hours while their kids are helping and your child out. You can do this in person by stopping by and thanking them, or if you ever want to email me your comments I’ll be sure to pass them on. Next time I'll write about our Purple, Brown and Red belts assistants.